God’s word is inspiring, and what better way to express our love of God than through art created by our own hands. The NIV Inspiring Words Holy Bible contains over 50 ready-to-color illuminated verses on high-quality thick paper as well as the complete text of the New International Version (NIV) translation. Thank you, Zondervan for sending me this bible for review. I was not paid for this review and all opinions expressed are 100% my own. Seriously do you have an art lover? How amazing to have a Bible that you can use your talents of art and still learn more about God!! 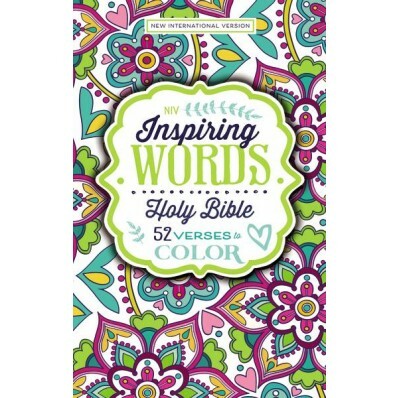 This book has so many beautiful pages to color and the coloring pages are on a card stock paper. Using the card stock paper will be easier to use and the paper will not rip like the thin paper used in many bibles. The pages that are not coloring pages are thinner. The Bible is so inviting as most people will be asking for the markers or colored pencils to join in and make a page beautiful. My daughter is so thrilled to have this book and now part of her night time routine can be to relax and color one of the pages as she tries to memorize scripture!